It undoubtably comes and goes every year, sometimes flashing by more quickly than others- the time for wreathes and toddies, carols and cranberry bread. The other day I came across this ad for Puerto Rican Rum and found it pretty amusing. It has served as the inspiration that awakened my holiday spirit this season, triggering thoughts of lovely things like rum…and nog…and drinking rum and nog mixed together from a silver tumbler while wearing a cozy turtleneck and making merry with friends….and other completely corny Christmastime activities. The consumables of December are definitely among the jolliest. As a kid I understood that the holiday excitement was officially beginning when my dad would start making his annual batch of eggnog, filling large Mason jars and sharing them with friends. Rum has been used in American eggnog since the days of the triangular trade (middle school history class, word up), its accessibility and low price leading to a rise in its popularity. These days, recipes may call for Cognac or various whiskies as substitutes. 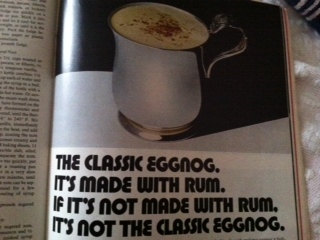 I believe that rum fits best, its sugar base being complementary to the creaminess of the nog. Take your take on the classic. Make it yours and use ingredients with integrity- fresh local eggs, Turbinado sugar, hormone-free milk- anything we create is only as good as its parts. As for rum for mixing, I like Flor de Caña, an affordable and well-made option from a Nicaraguan company with interesting roots in Chichigalpa, where its first distillery was built. Sprinkle some cinnamon, give it a little soul, sip with people who make you happy.